This past Monday the Board of Education passed the $688.2 million FY16 Tentative Budget and the document is a clear and unambiguous indication of the new Administration’s priorities – spending increases will go to the classroom where they will have the most impact on student educational outcomes. In addition, the Administration has taken some steps to “right size” the districts spending on non-classroom activities and has indicated that additional steps will be taken in the future. For the Administration’s perspective on the budget, see their press release here and the Superintendent’s blog post here. This budget answers the question posed – APS is changing direction in a big way. It is important to know that the Board and Superintendent Carstarphen spent a great deal of time establishing budget priorities and developing ways to fund them. While many decisions were made in the last Budget Commission meeting (which all Board members attended), there was extensive discussion on the budget in several Board retreats that were devoted to establishing a consensus on priorities and developing the tactical operational plan for next year. Without question, this Board and Administration have spent far more time on planning than any I have witnessed in the past. They were focused and goal oriented – it has been quite refreshing to watch it evolve and the Administration gets high marks for driving a “priorities based” and comprehensive process. I will go into much more detail in subsequent posts, but as a starting point, let’s look at the big picture and “follow the money”. The following chart very clearly tells the story of what the Board’s and Administration’s priorities are (click to enlarge). As a starting point, the total FY16 spending in the traditional schools is up $9.7 million as compared to FY15. As this is the Superintendent’s first budget, let’s focus on where the increases in funding went. Without question, the most significant change is the $10.1 million increase in Direct Instruction expenditures which exceeds the total traditional school cost increase of $9.7 million by $400 thousand. The traditional college prep courses increased by $6.2 million – a 2.9% increase as compared to FY15. The specialty programs (special education, remedial programs, vocational and non-traditional programs) increased by $3.9 million or 4.0% as compared to FY15. The bulk of the increase went to special education to bring the program into regulatory compliance. The message has been sent and delivered – spending in the classroom is a top priority and all other functions need to get behind what is being spent in the classroom. It is also important to note that Student Services – activities that directly support what his happening in the classroom – has a 22.8% share of the total increase. The FY16 budget has approximately $2.0 million for positive behavior support programs to enhance the learning environment. However, there is one change that will impact spending in the schoolhouse – the total spent on In-School Administrators (principals, assistant principals, academy leaders, registrars and school secretaries) is decreasing by $4.0 million and is being scaled back to spending levels incurred in FY12. It is important to acknowledge what has happened since FY12 – a number of schools have been closed or merged out of existence. Given the changes, this adjustment is warranted and is part of the Superintendent’s “district right sizing” plan and the reduced spending should have no effect on educational outcomes. When all schoolhouse activities are combined, over 86% of the spending increases have been directed to funding the education of students and providing additional support to improve educational outcomes. Central Office School Administration spending also increased by $1.2 million in FY16 as compared to FY15. As part of this category Professional Development increased by $860 thousand. However, in prior years this cost was primarily covered by Federal grants and, due to reduced Federal funding, had to be transferred to the General Fund in FY16. The Operations group (facilities, custodial, transportation and security) is also getting a $1.9 million share of the increased spending. While cost cutting measures have been taken in many of the departments, there is increased spending for much-needed HVAC maintenance, improved custodial services and the initial funding to bring the security resource officers back in-house (currently provided by the Atlanta Police force). These three areas account for an increase of $2.8 million, but these increases are partially offset by $900 thousand in reductions in other Operations departments. Another very positive change is the $1.8 million reduction in General & Administrative spending. Finance led the charge with a $1.1 million or an 8.1% reduction. IT spending is coming down by $355 thousand and Human Resources is reducing its cost by $221 thousand. These reductions are a start in the right direction and reverse a three-year trend of increased spending on General & Administrative functions. 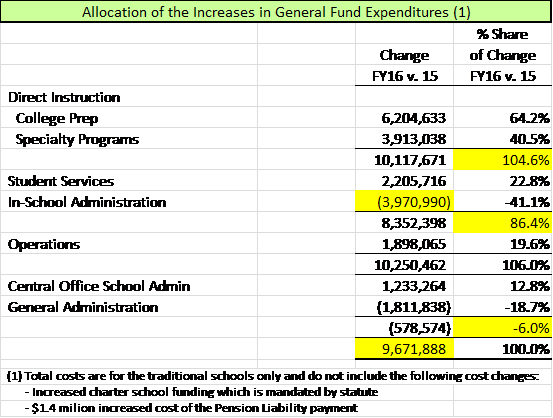 However, it is also important to note that the General & Administrative function costs have increased by $8.1 million (18.8%) since FY13 and it appears as if there is a lot more “right sizing” work to do here. The budget is still “tentative” at this time and we may see other changes before the final budget is approved in April. As the title states, this post represents Part 1 of the FY16 budget review and subsequent posts will get into a far more detailed analysis of the expenditures and cost trends across each major function. However, I believe that it is important to initially focus on the “big picture” – and as I have noted above, the statement made by this budget is positive and the spending priorities are focused where they belong – in the classroom. To the Board of Education, Budget Commission Chair Westmoreland, Superintendent Carstarphen and the entire Finance team – a great start and job well done! This entry was posted on Thursday, March 5th, 2015 at 7:59 AM and is filed under APS Board Meetings, APS Budget. You can follow any responses to this entry through the RSS 2.0 feed. You can leave a response, or trackback from your own site. Do you happen to know what in the budget would prevent APS Charter students in the gifted program from being scholarship eligible for the APS summer gifted program, Xanadu? Per the website “Charter students pay the APS student rate but do not qualify for scholarships.”. I’m just trying to get specifics but no one seems to know.